Last weekend, my dining companion and I couldn't decide on where to eat in Chatswood, given so many options for us to choose around the area. 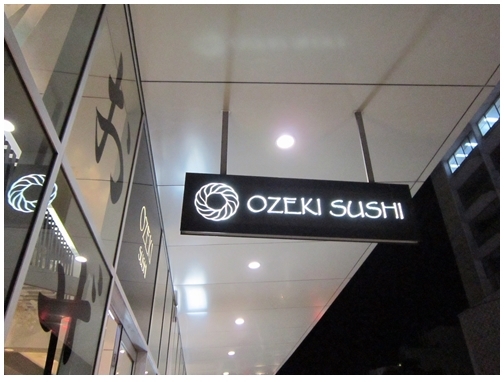 As we walked past a sushi train restaurant, we decided to check it out since we've not tried Ozeki Sushi before. The restaurant can be spotted easily along Victoria Avenue, just next to Chatswood Chase entrance. From the outside, the restaurant looks quite cosy but it is a little small inside and can be crowded when business is brisk. 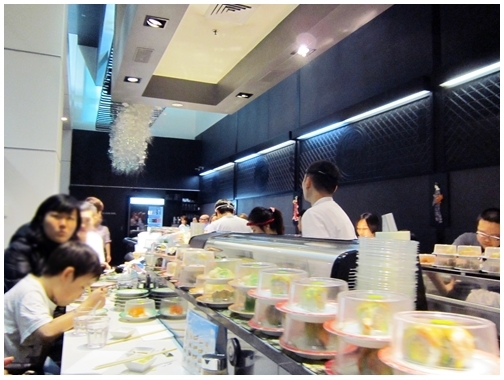 It can accommodate about 30 to 40 customers around the sushi train with sushi preparation workstation in the centre. The business was good during our visit and there's a constant flow of customers filling up the empty spots quickly. Being first-timer patrons, we were unsure of what to order from the menu. 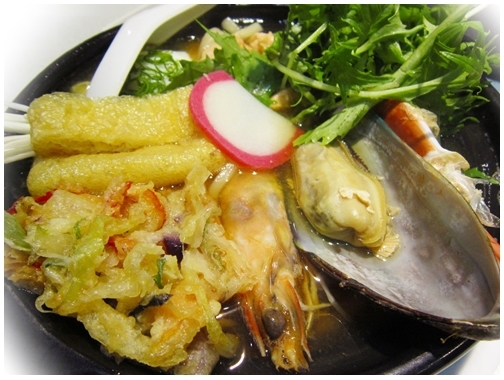 There is a wide selection of salad, tempura, sushi, and hotpot to sample. Since I can't eat raw fish / sashimi, it helped us to narrow down our choices. At last, we decided on our food and placed our orders. Some sushi dishes were made-to-order the others were ready-made and placed on the conveyor belt. 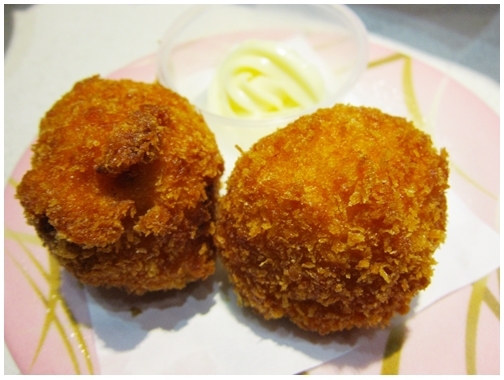 We started off with deep-fried crab meat balls for appetizer. Though this was taken from the sushi train, it was still warm and and crispy. It was nothing out of ordinary but I like the crab meat filling, which was tender and moist inside. They were served with mayonnaise dipping sauce and the portion was just nice for two to share. 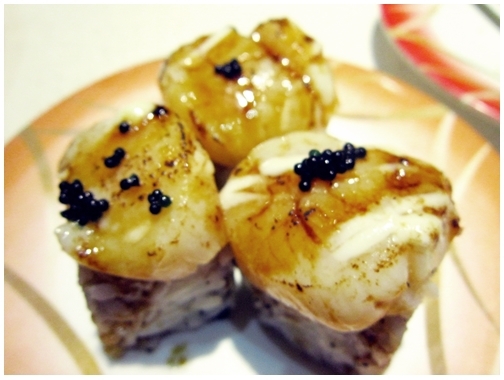 The next dish, Grilled Scallop Sushi, was made-to-order, prepared by the staff before our eyes. The scallop was nicely grilled, sweet and juicy topped with bits of caviar. 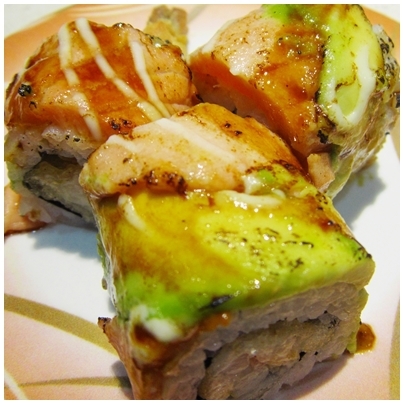 It blended very well with sushi rice rolled with tuna paste and avocado slices. Delicious indeed! While waiting for our next order to be prepared, we sampled the Grilled Salmon and Prawn Sushi simply because they looked so mouthwatering as they passed through us on the conveyor belt. And lo! it tasted as good as it looked. Wrapped in nori (Seaweed sheet) and fluffy sushi rice, the crispy tempura prawn was succulent. The thinly sliced grilled salmon and avocado were layered on top of the sushi. It's quite a mouthful of flavour and texture. Our anticipated Soft Shell Crab Sushi were finally served. They were generously packed with crab meat, tomatoes and cucumber, all wrapped in nori and rice covered with fresh fish roe on the outside. Last but not least, we ordered a bowl of seafood hotpot to share as I was craving for something hot and soupy to counter the cold weather. The hotpot dish was definitely value-for-money considering the amount of seafood served (crab claw, mussel, prawn, salmon chunks). It was perfect for the two of us. The broth was flavourful and the udon was soft and chewy. However, it was a little hard to eat the crab claw without getting the hands dirty. 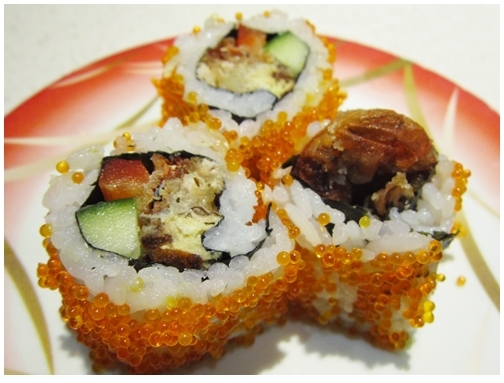 Overall, we had a pleasant experience in Ozeki Sushi - good service, tasty food, affordable price and friendly staff. However, we would prefer if the table is more spacious but it would not deter me from coming back again.